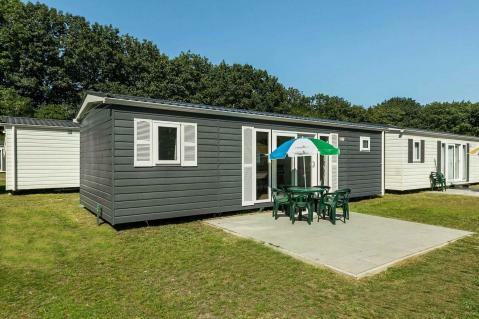 Vakantiepark Hengelhoef in Houthalen-Helchteren - the best offers! 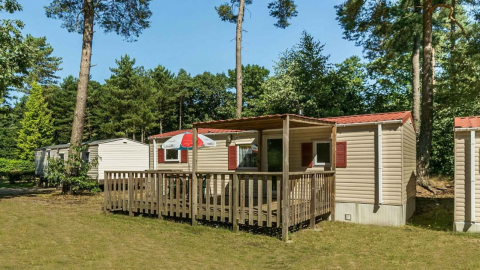 This price applies to 4-person mobile home/caravan Laambeek, with the arrival as 3 June 2019, 2 Nights. This price applies to 6-person mobile home/caravan Hertenkamp, with the arrival as 3 June 2019, 2 Nights. 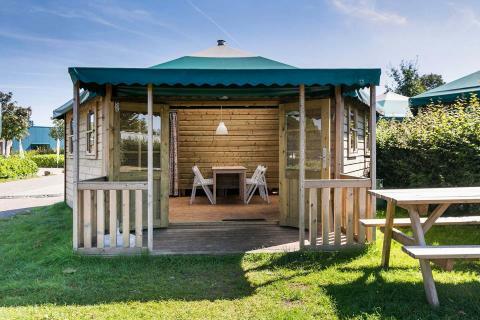 This price applies to 6-person mobile home/caravan Reeën, with the arrival as 3 June 2019, 2 Nights. This price applies to 8-person apartment Van Craenwick, with the arrival as 3 June 2019, 2 Nights. Pets are always on request. This request has to be approved by the holiday park. Bringing your pet costs €5 per pet per night and a €10 cleaning fee. Enjoy your holiday in Hengelhoef, Houthalen - an ideal location for water lovers! Have fun in the tropical swimming paradise, and enjoy a delightful walk in the woods. Looking for some day trip ideas? Why not go to the castle brewery Ter Dolen, where you can taste some of the best local Belgian beers. Next to the lake, you can enjoy the sandy beach and sunbathing area, or play beach volleyball, football or basketball. If you’d rather something more relaxing, you can spend an afternoon fishing. 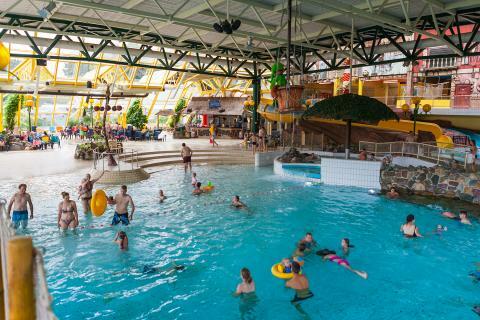 There is a large tropical swimming paradise for those who want to enjoy the wave pool, lazy river, and various slides. If you really need to unwind, you can make use of the sauna, steam bath, herbal baths, jacuzzi and solarium. During the school holidays, fantastic entertainment programmes are organised. There are nightly variety shows and sporting events. You can teach the kids how to play petanque, or enjoy a game of mini-golf, table tennis or football. If you fancy a day out exploring the surroundings, you can rent a bike on site. Your whole family can enjoy themselves in the fantastic subtropical swimming paradise. For the little ones, there’s a separate infant and toddler pool. Furthermore, they can go to Villa Victor, the indoor playing area where they can slide, climb, crawl and enjoy. The pamper zone is furnished with a mini slide, balls and soft playing apparatus. During school holidays, kids can participate in activities such as games afternoons, children's bingo and treasure hunts. There is even a bouncy castle! The covered plaza in the centre of the holiday park is equipped with terraces, restaurant-tavern Renardeau, an atmospheric bar, a snack bar and a supermarket. 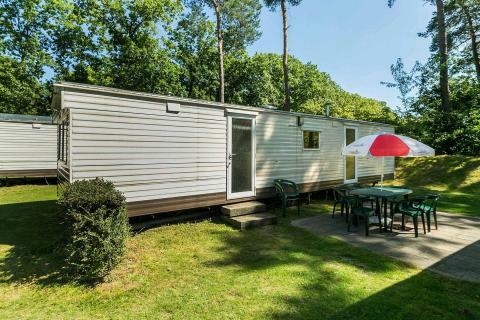 Vakantiepark Hengelhoef is situated near the stunning Belgian nature reserve, Tenhaagdoornheide. Its rolling valleys and rich woodland will amaze the entire family. There are also many day trip opportunities nearby, including a visit to the castle brewery Ter Dolen, or a traditional Flemish town such as Hechtel-Eksel or Peer. For most requests/preferences, a fee of €16.50 will be charged per accommodation. If your request/preference is approved, you will find this cost on your invoice. Groups can stay only on request at the holiday park. If your application is accepted by the park, you will be asked to pay a deposit of €50 per person. During big events in the area of the park a deposit may also be required, of all guests staying during this events. Off-season: facilities are not or partially open. Peak season: depending on the occupancy rate of the park, it is possible that some facilities are not or partially open.